Minnie Cumnock Blodgett (1862–1931) graduated from Vassar College in 1884, later becoming a trustee (1917–1931). She is the mother of Katharine Blodgett Hadley (VC '20), who was also a Vassar trustee (1942–1954), and was chairman of the Board (1945–1952). 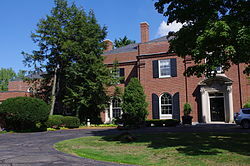 Her husband, John W. Blodgett, built their estate, which they named Brookby, where they made their Grand Rapids home. After Ellen Swallow Richards' death in 1911, Julia Lathrop (1858–1932), another of Vassar's most distinguished alumnae, continued to promote the development of an interdisciplinary program in euthenics at the college. Lathrop soon teamed with alumna Minnie Cumnock Blodgett, who with her husband, John Wood Blodgett, offered financial support to create a program of euthenics at Vassar College. Curriculum planning, suggested by Vassar President Henry Noble MacCracken in 1922, began in earnest by 1923. In 1925, through a gift of $550,000.00 from Mrs. Blodgett, the Institute of Euthenics was founded at Vassar. Its aim was "to supply scientific knowledge of the complex problems of adjustment between individuals and the environment, emphasizing home and family." Vassar historian Colton Johnson noted "The Blodgetts' gift was the largest gift given to the College after Matthew Vassar donated $408,000 in 1861 to get the College started ... Their intention was to bring into the curriculum of the College a course of study specifically designed around the ideas of Ellen Swallow Richards." Mrs. John Wood Blodgett died suddenly of heart disease on October 13, 1931 in her suite in The St. Regis Hotel, New York, NY. She was there to attend meetings for two health organizations and spend some time visiting her daughter and son-in-law. According to her obituary in the New York Times, she was a director of the Child Study Association, the National Organization for Public Health Nursing, and was a member of the National Committee on Mental Hygiene. She was the daughter of the late Mr. and Mrs. Alexander G. Cunnock [sic] of Lowell, Mass. She was also president of the D.A. Blodgett Home for Children, and sat on the board of trustees at Vassar College. John Wood Blodgett, Jr., who married Sally Reed Gallagher, of Milton, MA, on September 28, 1939. He attended St. Mark's School in Southboro, and graduated Harvard in 1923. Kathrine Cumnock Blodgett Hadley, who married Major Morris Hadley, July 12, 1919. John Wood Blodgett Hadley (1930 - 1994). who married Katrina Boyden Hadley (1930-1969), she is buried in the Blodgett Plot. ^ "John W. and Minnie Cummock Blodgett Estate". State of Michigan. Archived from the original on May 28, 2012. Retrieved March 6, 2011. ^ Vassar Historian. "The Minnie Cumnock Blodgett Hall of Euthenics was completed, York & Sawyer, architects. - - A Documentary Chronicle of Vassar College". chronology.vassar.edu/. Retrieved 26 August 2013. ^ Vassar Historian. "The Disappointing First Thrust of Euthenics". vcencyclopedia.vassar.edu. Archived from the original on 27 January 2014. Retrieved 26 August 2013. 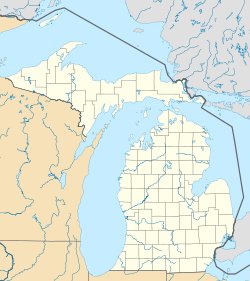 ^ a b "SOCIAL WORKER DIES AT 68 ON VISIT HERE - Mrs. John W. Blodgett of Grand Rapids Had Been Guest of Her Daughter and Son-in-Law. ONCE TRUSTEE OF VASSAR Director of Child Study Association and of National Organization for Public Health Nursing". nytimes.com. NY Times. 1931. Retrieved 5 September 2013. ^ NY Times (1939). "SALLY R. GALLAGHER TO MARRY SEPT. 28; Sister to Be Maid of Honor for Fiancee of J.W. Blodgett Jr". nytimes.com. NY Times. Retrieved 5 September 2013. ^ NY Times (1919). "MISS BLODGETT WED TO MORRIS HADLEY; Bride of Son of Yale's President at Her Summer Home at Prides Crossing, Mass". nytimes.com. NY Times. Retrieved 5 September 2013. ^ WOLFGANG SAXON (1996). "John [Wood Blodgett] Hadley, 64, Philanthropist And Investor". nytimes.com. NY Times Obituary. Retrieved 5 September 2013. ^ Michigan Historical Collections staff. "BHL: Blodgett Family papers, 1872-1953". bentley.umich.edu/EAD/. Retrieved 6 September 2013.